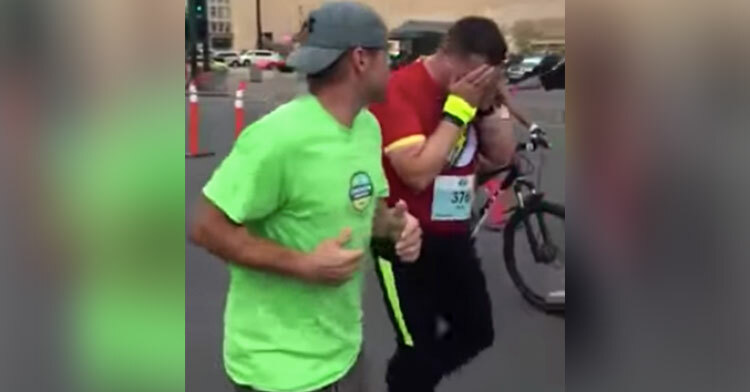 Stranger Notices Exhausted Man About To Quit Marathon So He Runs With Him — For 4 Hrs. As we navigate through the crazy, beautiful mess that is life, every single one of us needs encouragement from time to time. 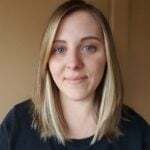 We all experience moments in which we feel so physically tired or mentally exhausted that we just want to give up. That’s when we benefit the most from a helping hand or kind gesture. During a marathon, one man got an excess of both, and he couldn’t have been more thankful for the push. 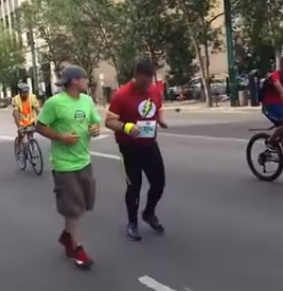 In 2016, Rene Wache was volunteering at the Edmonton Marathon in Alberta, Canada, when he noticed that one of the competitors was really hurting. 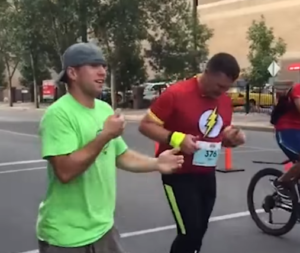 The runner, Sean Kachmarski, was close to quitting after passing the 10-mile mark. That’s when Rene jumped in and began running with him, cheering him on and offering words of support. Though he hadn’t intended to, he ultimately stayed by Sean’s side for the next four hours, going above and beyond to ensure he’d complete the race. With Rene’s encouragement, Sean pushed through the pain and focused solely on putting one foot in front of the other. Sean’s cousin captured the heartwarming interaction as he entered the last 100 yards of the race. At one point, he even picks up the pace, sprinting for a few moments. 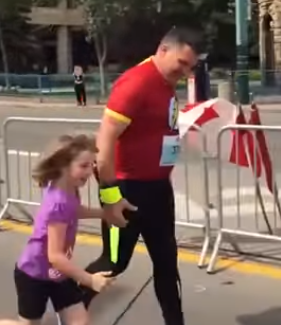 Sean’s daughter runs over to grab his hand and takes over for Rene, who ran alongside the pair as they crossed the finish line together. 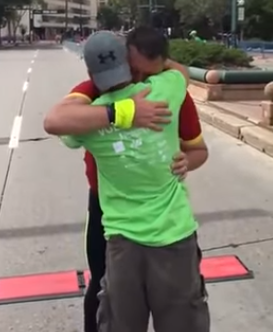 Sean’s gratitude is visible as he wraps his arms around the man who helped him achieve his goal. “Rene was just unbelievable and I always ask myself the question, ‘Would I have finished If Rene had not been there?’ But it was just still such a magical moment and he stayed with me the whole time and he was yelling — not yelling at me — but he was supporting me and he was yelling encouragement all the way through,” Sean later said. It would be an understatement to say that completing a marathon is no easy feat. It takes hard work, perseverance, and, we’d imagine, a lot of blood, sweat, and tears. What Rene did to get a complete stranger through his struggle says a ton about his character. 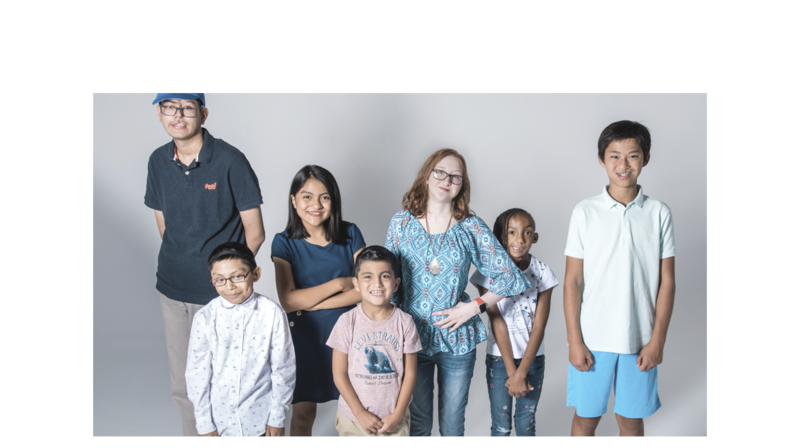 Watch as Rene pushes Sean toward the finish line in the clip below, and share with anyone who needs some encouragement.